Bloggin' 'bout Books: Who Needs Candy Canes and Mistletoe When You've Got Zombies? Who Needs Candy Canes and Mistletoe When You've Got Zombies? I don't know about you, but nothing gets me in the holiday spirit quite like ... zombies. Something about rotting flesh, vacant eyes and gaping, hungry mouths just says Christmas to me. 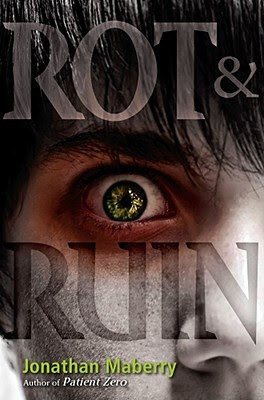 Okay, maybe not, but I wanted to read Rot & Ruin, Jonathan Maberry's YA horror novel, before the year ended. Even if its content is more suited to October than December. The story takes place in central California, 14 years after a zombie outbreak decimates the country's human population. Small enclaves of the living remain, their makeshift towns dotted throughout the state, probably the whole U.S., maybe even the world. Fifteen-year-old Benny Imura wouldn't know; he's lived inside the thick walls of Mountainside his whole life. He knows about the living dead, of course, but he's never been foolish enough to venture beyond the town into their territory. Although its littered with signs of human habitation - smashed cars, crumbling buildings, abandoned homes - the great Rot and Ruin no longer belongs to the living. Only armed bounty hunters journey out into the wasteland, and then only to scavenge for supplies or complete contracted zombie kills. Everyone else stays inside the walls. Safe. Zoms really aren't Benny's problem. Sure, he collects the trading cards, listens to hired guns brag about their kills, and practices defensive maneuvers in Scouts, but he's content to keep his distance from the brainless monsters. Benny's got enough to worry about. If he doesn't find a job - and soon - his food rations will be cut. The prospect propels him to search for a fulfilling career, something other than the family zombie killing business. Only no one seems to be hiring scrawny kids with poor eyesight. Resigning himself to an apprenticeship with the most boring bounty hunter in town (who happens to be his big brother, Tom), Benny sets about learning the grisly art of executing zombies for cash. It wouldn't be so bad if his teacher was a celebrity hunter like Charlie Matthias, who's always swapping cool hunting tales down at Lafferty's General Store. But it's not. It's his goody-to-shoes older brother. The rest of the town respects Tom's gentle ways, but Benny knows something no one else does - despite his impressive sword-fighting skills, Tom's a coward, the last person on Earth who should be dishing out advice. As little as Benny respects his brother, spending time with Tom opens his eyes to things he's never even considered before. He learns that things and people are not always what they seem; that zombies aren't the only creatures to fear in the Rot and Ruin; and that true heroes are those who don't let their nightmarish living conditions steal their humanity. What he sees outside of Mountainside will change him. Forever. I brought this book back from BEA for my husband. Not sure it's my thing, but I might read it at some point. Im always looking for some zombie-lit with a bit more substance.. this just may not be it, but I'll grab it soon anyway!